Yoga and climbing just go together. It’s a beautiful symbiotic relationship. Both increase balance, core strength, flexibility and mental discipline through a series of fluid movements and holding contorted positions all the while breathing in a controlled rhythmic fashion. Plus, yoga has the added benefit of helping to prevent injury by stretching muscles and increasing range of motion. My yoga journey began 15 years ago with a VHS tape and a yoga mat. Growing tired of the gym and my step aerobics routine, I was looking for a low impact workout with a little bit of stress busting on the side. I read about Ali McGraw’s cinematically produced Yoga Mind & Body video in Shape Magazine. That seemed to be the ticket. I immediately fell in love with the video. At first I could barely keep up with the yoga, but the hypnotic soundtrack and white sand desert and blue sky backdrops kept me interested day after day. I knew with practice I’d get closer to being as bendy and peaceful as the students in the video. As my yoga video collection grew so did my flexibility and understanding of yoga. I learned to use controlled breathing to calm my nervous system and impart a sense of well being. I learned to face each new challenge with an open mind telling myself “I can” rather than “I can’t.” I had no idea at the time that the ability to focus positive energy to find stillness and strength in a long difficult stance would serve me well in my future climbing endeavors—let alone teach me to cope with “life” off the mat. I’m not going to lie. My stomach flipped and my heart nearly pounded out of my chest as I made my way up the junior sized rock wall. Part seasick or part panic attack—I was not sure. Oh, did I mention my fear of heights? Despite my queasy anxiety, I embraced the challenge and made it the top. Immediately I loved climbing! I made it a point to visit the rock wall as many times as I could armed with a handy skill. It was my positive mental focus and yoga breath that kept me from getting gripped or hurling on my belayer! The end of the cruise marked the end of my climbing for the time being. I was living in a big-city suburb and had no idea how to pursue my new-found passion. So I continued my yoga practice and began visiting yoga studios as often as I could afford. Life dealt me some turbulent times in the years that followed. I discovered that the things that I was learning on my mat were also of use to me off the mat. Things like patience and letting go of that which does not serve me. I learned to live in the present moment and see my current situation the way it was. I proved to myself that I am stronger than I think I am. These were important lessons I needed to make difficult decisions. Fast forward to four years later. I was now living in Las Vegas and enjoying a turbulence-free outdoorsy lifestyle of hiking and such. Seeing climbers out and about often reminded me of my week of cruise ship climbing. Then finally it happened! I met a hiker that climbed AND was willing to show me the ropes. I picked up right where I left off at the climbing gym. Soon after I was sport climbing at local crags and discovering the sharp end. 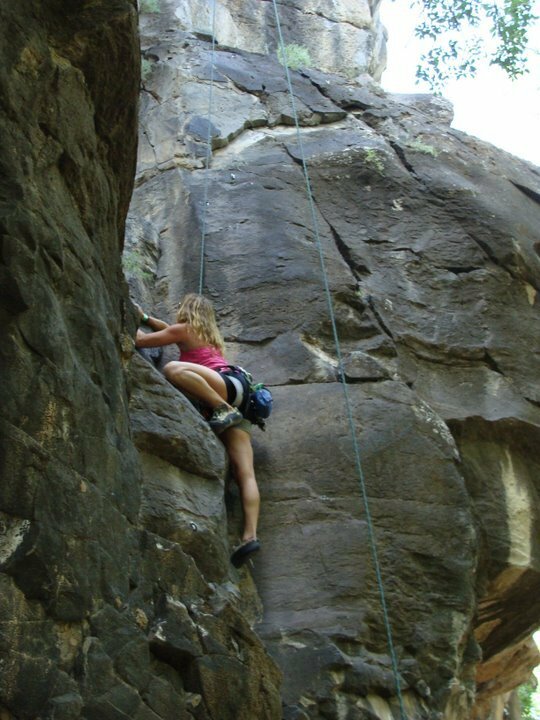 At first I resisted trad climbing (the multi-pitch fear of heights thing), but thanks to some awesome climbing partners and the lessons I learned in my yoga practice I managed to realize my true love in climbing. These days I do hot yoga several times a week and climb on weekends as much as I can. My favorite climbs are longish moderate trad routes, but I’ll happily climb whatever suits my schedule and company. I’m thankful that I live in the midst of a climbing mecca and have a rock climbing husband who enjoys similar pursuits. My yoga continues to evolve and keep me in touch with me. It’s been 10 years since that first climb and I’m still not a fan of heights. But, through yoga and climbing, I have learned to hang on, breathe and just go with the flow. Thank you, Marija!! Yes, climb and I’d love to hear your story too. 🙂 Hope to see you at RRR! I’ve been climbing about a year, and recently moved to Las Vegas. I usually climb with my boyfriend but I really want to meet some local women to climb with also. I don’t go to the gym and have had trouble meeting local women who climb. 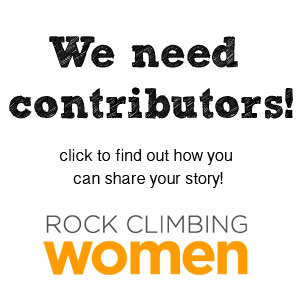 Do you know of any “groups” that are formal or informal around here of climbing ladies? I’m on the low end of experience but started leading recently sport and trad both and loving it!! 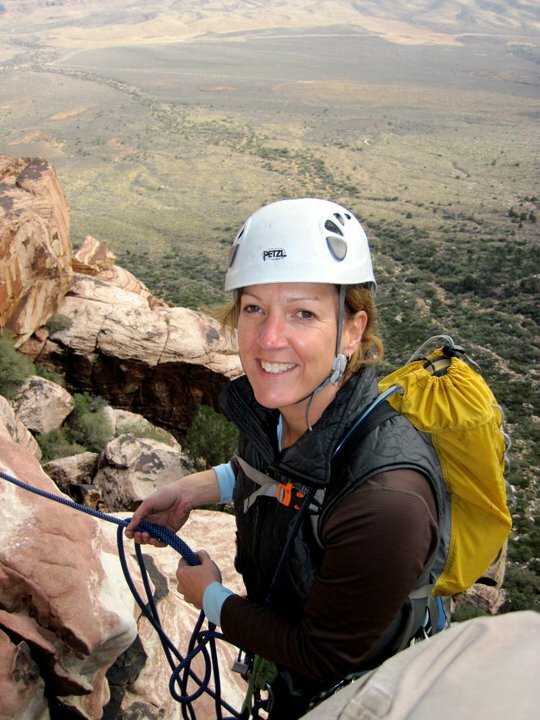 Hi Jennifer 🙂 Join us for RockClimbingWomen.com’s Happy Hour on May 5th! More info here: https://www.facebook.com/events/611314248943725/?ref_dashboard_filter=upcoming. You can also check out MountainProject.com or get involved in the Las Vegas Mountaineer’s Club or the Las Vegas Climber’s Liaison Council. There’s also the Las Vegas Climbing Meetup. Climb on! Hey Jennifer! I just got your email too, but Sue really summed up what I was going to say! Please join us on May 5 (https://www.facebook.com/events/611314248943725/) and get to know some awesome gals! We have some parallel experiences here! 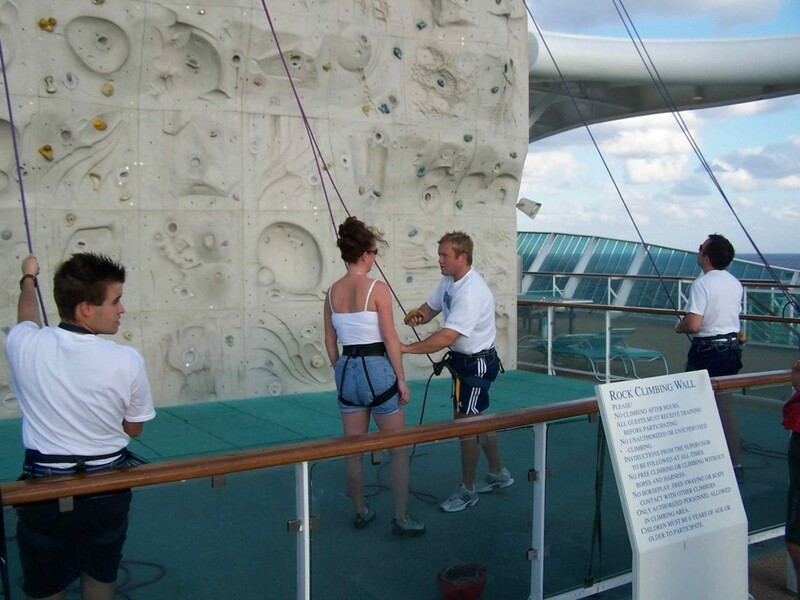 I also went on one of those Royal Caribbean huge ships, with a rock wall. Our son is a rock guide and has been climbing most of his life, but I had not begun until that day on the cruise. I just decided it was time to go for it. I fell in love and have been climbing ever since. Hi DeeDee– That’s awesome! I’m sure there are more of us out there. Haha! Yes, yoga rocks! !